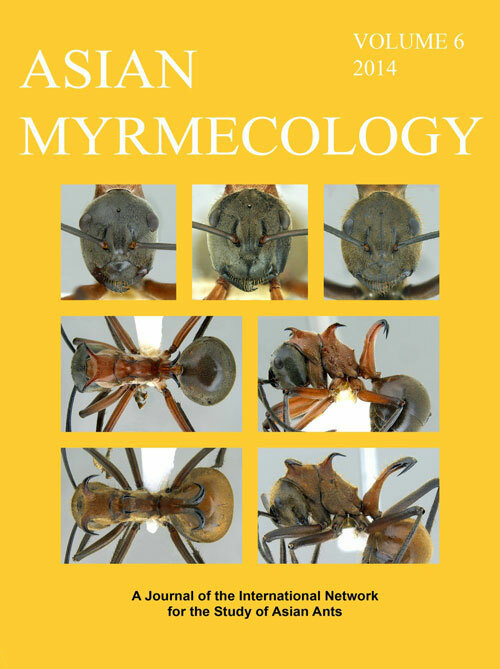 Abstract: Information on the biogeographical composition and spatial distribution patterns of ant assemblages in Mongolia is relatively scarce. In this study we investigated species richness, spatial distribution and biogeographical composition of the Mongolian ant fauna and recorded a total of 71 species belonging to 17 genera and three subfamilies. Genus and species richness of ants is lower in Mongolia than in most surrounding geopolitical regions. Using published literature as well as our own data we examined how ant species richness was related to phytogeographical elements. The major part of the Mongolian ant fauna is associated with the mountain taiga and forest-steppe ecosystems. A few ant species belong to the arid steppe, semi-desert and desert ecosystems. We observed no significant correlation between species richness of ants and land area size of phytogeographical regions; however, species richness of ants and plants in various phytogeographical regions showed a significant positive correlation. We did not detect strong differentiation of ant species along the elevational gradients of the country as most of the species were recorded in a wide range of elevations, but mid-elevational altitudes (1000 – 2000 m a.s.l.) showed the greatest diversity of ants. Regarding the biogeographical composition, species with wide geographical distributions, i.e. Transpalaearctic species together with Eastern Palaearctic, Central and East Asian elements, comprise a large proportion of the ant fauna in Mongolia. The ant fauna of Mongolia does not differ significantly from that of neighbouring regions, and the majority of species occurring in this country probably originated in neighbouring areas to the west, north and east.